This one escapes my memory, which isn't hard to do. I'm pretty sure my girls had this gum. It sure looks cute. Aww I wanna see what's in the box! Wow, I don't even remember these but then again I was born in '78 so they might have been gone by the time I was old enough to remember. 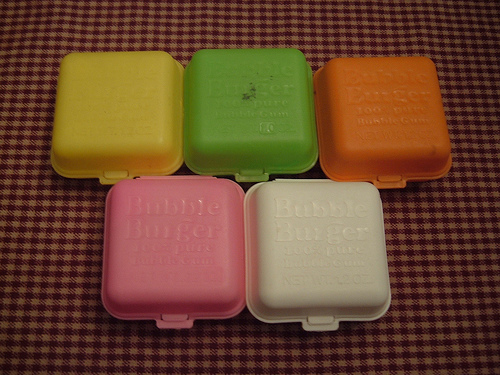 I don't remember Bubble Burger gum but would have flipped for it as a kid. 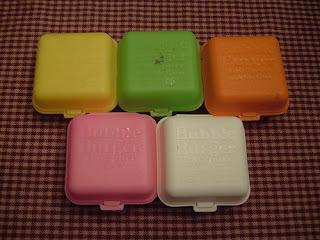 I also remember bubble gum that came in little tiny egg cartons around Easter. I used to love that. I think they still make those too! I loved this stuff, but I loved Big League Chew more because it made me feel like a man. A man with cancer of the mouth. I totally love the egg shaped gum that is sold in little egg cartons. I also love the gum that was sold in tubes and big league chew. Dang, I should just start a gum blog. I have blogged about gum so many times. With Cheeseboy though my mom wouldn't allow it...I guess she though it was too much like chewing tobacco. Funny though, we could buy candy cigarettes and bubble-gum cigars though. Was the gum one piece or could you separate the gum. The bun, cheese, patty. I am remembering both ways. Omg... I am 37 yrs old and I was just tell my kids about how this was my favorite gum when I was 4 yrs old. O and another funny thing my birthday is May 22.. that's the same date this picture was posted.